Spoon on some summer memories. 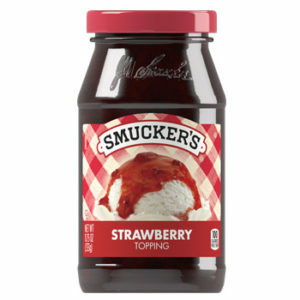 This sweet Smucker’s®Strawberry Spoonable Topping will brighten your day and please your taste buds. Corn Syrup, High Fructose Corn Syrup, Strawberries, Sugar, Water, Contains 2% Of Less Of: Citric Acid, Pectin, Red 40.